A while ago I discussed the nine fundamental structural sub-systems of any game. (17 March, http://www.gamecareerguide.com/features/720/the_nine_structural_subsystems_of_.php). (Summary below.) These elements are a good starting point for defining your game concept, but there’s a lot more to be said. The following are questions, or “decision points”, for a designer to consider after he or she has established a framework. It should be most useful to people who are learning to design games. This list has grown as I’ve tried to come up with a set of questions that can be used to define and refine the nature of a game (whether non-electronic or electronic), once we have settled on the structural choices. Many of these questions are primarily of interest in non-race games with more than two sides. Races aren't unusual in video games (Mario Kart is the most well-known recent race game), yet they are a very specialized version of multi-sided games because in most such games there is little you can do to hinder the opposition. Many boardgames and most card games are “multi”-sided (more than two sides). A trend in video gaming is toward multi-sided games, a way to have several people participate and compete directly, rather than indirectly via high scores or times, with one another. Over time, then, some of these questions will become very important for many video game makers. Here in summary are the twenty “questions” I've identified so far, followed after the question list by a brief discussion of each. Is this an “emergent”/rules-dominant game or a “role-assumption”/story-dominant game? How “big” and how long will the game be? What is the level of action or “granularity”? What is the genre of the game? This is related to theme/story, and is very important in electronic games, less so in non-electronic. Genres might be “sweep of history” game, “shooter”, role-playing game, real-time strategy game, resource management game, etc. But a designer may not think about genre to begin with, and may end up with a game that defies standard genre-categorization. Is it competitive or cooperative? Most of the time the game will be competitive, but occasionally, all (or almost all) of the players will cooperate with each other. “Co-op”, to an electronic gamer, means two or more players cooperating against the computer, say in a “shooter” game. On the non-electronic side we have Reiner Knizia’s Lord of the Rings game, where all players cooperate, and Days of Wonder’s Shadows Over Camelot, where there might be a traitor amongst the players; in both cases the game system provides the opposition. AAA list electronic games are often symmetric from player to player, except that there may be asymmetry coming from different starting characters. Starcraft (as many other RTS games) is asymmetric because the three races are functionally different. Diplomacy is an epitome of zero-sum; Risk has some aspects of it, as do many wargames with strong economies (e.g. Axis & Allies). Role-playing games (electronic or otherwise) are rarely zero-sum, though there is the element of “I kill monster, I get monster’s stuff”. RTS games are zero-sum in the sense that there is usually a limited amount of resources available, and if one player gets a resource, the others cannot get that resource. Another way to pose this: is your opponent's loss your gain, or your gain your opponent's loss? If the game is two player ZS, the answer will always be "yes" . If it is multi-player, someone will gain when someone else loses. Games in which you score points regularly through the course of the game tend to make zero-sum unlikely, I'd say, and encourage situations where it's hard to hinder an opponent while at the same time helping yourself. (How many games let you take points away from another person that have already been scored?) Of course, there are exceptions, this is a tendency only. This question is related to the “Player Interaction Rules” sub-system, and one could argue against including it here. This one concentrates on the number of players and sides, however. Football has 22 players, but only two sides. When video game people say “multi-player”, they often mean in this sense of many people playing, but no more than one or two sides or “every person for himself”. “Multi-player” in the non-electronic world usually means “more than two sides, one player per side”. Is this an “emergent”/rules-dominant game or a “role-assumption”/story-dominant game? Board and card games, especially the “traditional” games, tend to have no narrative, no story. There is a set of rules, and play “emerges” from those rules. “Rules-dominant” might be a better term. Many electronic games, such as Tetris, also have this characteristic. Another way to look at this is that in these games the player does not assume a role, he does not usually think of himself as a person experiencing some aspect of an imagined life. Even in Monopoly, theoretically a game about real estate trading, players don’t think of themselves as entrepreneurs. But many electronic games, especially the newer ones, incorporate an avatar, and a story of some sort happens to that avatar. The player thinks of himself as the avatar. These might be called “role-assumption” or “story-dominant” games. Which is yours? The epitome of the story-dominant game would be made in an environment like The Matrix or the Star Trek holodeck. Some designers believe that the designer should, as much as possible, “hide” himself within the game, so that players are less likely to think of it as a game and more like reality. Opposed to this is the rules-emgergent point of view, where the players know they are playing a game with rules, and want the designer to do his best to make rules that result in an entertaining game. How “big” (and how long) will the game be? You can design little games, short games, “monster” games, games that take 10 minutes to play, games that take 40 hours to play. What will it be? The audience has a lot to do with the answer to this question. How complex is the game? Complexity can come from the rules or from the play, or both. The rules of chess are fairly simple, but the play is complex. Generally speaking, the larger number of plausible choices a player has, the more complex the play, but that is not always true. “Euro-style” games try to keep the number of plausible decisions small at any given time, in order to avoid “analysis paralysis”. In many electronic games, anyone who dallies when making a decision is wiped out, so the number of plausible decisions must be fairly small. This refers to what kind of “force” or “agent” the player controls. If it involves violence, is action conducted on a tactical (individuals), grand tactical (battles), strategic (warfare including economics), or grand strategic level (series of wars)? A shooter is always tactical, an RTS is generally strategic, Civilization is grand strategic. If the game does not involve violence, it still has a level of action, which is most likely individual. Mario games are always at that level, for example. Another way to look at this is, how many “pieces” does the player control/keep track of, from one up to hundreds. At higher levels of granularity, economics of some kind (production of units) is likely to be important. Abstract games may be difficult to gauge, though in the end they tend to involve one piece at a time, as in Tetris, or a few as in Bejeweled. Checkers and chess are tactical games, as the number of pieces is quite small and only one can move at a time. RPGs are necessarily tactical. How strongly will the decisions of the players influence the outcome of the game? Some Euro games, and almost all traditional American family games, are designed so that even if a player is making mistakes, the gameplay can allow them to recover and win. In other words, we want the non-adult or inexperienced players to still have a chance to win. Many wargames are not so designed, and a person who isn't concentrating and isn't making good decisions will rarely, if ever, win. Years ago I christened this characteristic the "gyp factor". If a game lets a less skillful player win often, the skillful player is "gypped" (you can see what school of thought I come from . . .). See http://www.pulsipher.net/gyp_factor.htm. Here's the lead sentence: "The Gyp Factor (GyF) of a game is the degree to which it permits or prevents the expert (near-perfect) player from winning consistently against less than expert but at least average players. If the GyF is very low, the expert will beat the good player virtually every time--chess is an example. If the factor is very high, the expert wins no more often than the good player--in other words the expert is gypped because his additional ability cannot be exerted in the game". See http://www.pulsipher.net/game_playing_styles.htm or the February 2005 Games Journal. Which kind of skill does a player need to use, adaptability, or planning? Some games such as War of the Ring, and "card driven wargames", place the premium on adaptability, because you don't fully control what your side does. The roll of the special dice, or the draw of the cards, makes a big difference. Other games (chess, obviously, and traditional hex wargames) place a premium on planning. Euro games tend to focus on adaptability, which often makes for less analysis than older wargames. You can also suppose that the more information is available, the more planning is emphasized (think chess), and vice versa. Related to this is the question, what is the level of Fluidity or Chaos in the game. How much does the situation change from one "play" (turn) to the next? How much can a single "move" by one player change the situation? A high "take that" factor (one move changes things drastically) often indicates a highly fluid game, and a fluid game usually requires adaptability more than planning from the players. Which kind of skill does a player need, quick reactions (typical in shooters, for example), or careful deliberation? Probably the majority of electronic games require quick reactions, while the vast majority of non-electronic games require deliberation. Is the game "mechanical" or "psychological"? That is, is the game largely determined by positions and pieces, or by psychological effects? This is a very difficult question: Which one is Diplomacy? While the mechanical aspects are important and occasionally vital, mostly it is a psychological game determined by negotiation (as most people play it). "Romantic" players tend to make any game psychological, while "classical" players tend to concentrate on the mechanics. Further, experienced electronic game players tend to turn all the single-player games they play into mechanical exercises, finding the very best set of circumstances to give them the greatest advantage. What is the outstanding mechanism involved? It’s possible that nothing will stand out, but many games are essentially an exploration of one mechanism–e.g., checkers, Tic-Tac-Toe, Tetris, Pac-Man. What are the dynamics of being ahead or behind in the game? "Leader-bashing" might be defined as the tendency of players to gang up on, and drag down, the leader. If this is too easy, the game becomes an attempt to avoid looking like the leader. If it is too hard, the game becomes multi-player solitaire. Some games address this question by making it unclear who the leader is. In a three-player game in particular, the "petty diplomacy problem" (as R. Wayne Schmittberger calls it in New Rules for Classic Games) is related to this: when one player realizes he cannot win, how easily can he determine, by his actions, which of the others wins? (This ability to determine who wins is called “kingmaking”.) If it is easy to do this, then the game probably isn't much fun to play, in the long run, for many types of players. Some people believe that a good game naturally falls into three phases, the opening or beginning, the middle game, and the end game. Chess is often looked at in this light. (This is something like the “natural” three-act form of plays and films.) While not all games need to have these phases, the question might be, What phases does the game naturally fall into? For example, the boardgame Britannia has four phases: the Roman dominance, the Anglo-Saxon dominance, the Viking invasions, and finally the endgame with three (or four, in Britannia Second edition) kings in competition. Many real-time strategy games fall into phases, one being base-building, another being securing adequate resources, the final one being destruction of the opponent’s base(s). If the game feels the same at all times, it will be less interesting than when it changes through two or more phases. Is the game "serious" or "just for laughs"? Chess is serious, party games are just for laughs. Games for the Wii tend to be less serious than XBox360 games. Both types can be combined in one game in different amounts. Is the game “ruthless” or “nice” (a competition or an entertainment)? Some games are “entertainments”, games where winning is either not the main thing, or is something that everyone can do (via cooperative gaming). They’re “nice”. Some games are competitions, where winning is very important, and “nice” is not part of the equation–so for short I call it “ruthless”. This question is different from “serious or for laughs”, but certainly related to that. An RPG gamemaster (GM) is more or less responsible for the entertainment of the group--if they're not entertained (overall) they won't continue to play. The players are also responsible, but not nearly to the same extent, each is mostly worried about himself. The GM has a lot more influence. He's not there to be an opponent, he's not there to enjoy himself though we hope he will. He's not the opponent of the players, he's the neutral referee/facilitator. The game designer has the same situation and responsibility. he should not be designing a (commercial) game to enjoy himself, but to enable players to enjoy it. He is not the opponent of the player, not there to laugh at the players and their frustrations. He's there to entertain the players. The publisher's market for Britannia-like games doesn't seem to reflect the purchasing interest. That is, I'm finding it hard to find companies interested in publishing Britannia-like games. Phalanx (publishers of Italia) has been pulled into its parent company, 999, which tends to a broader market, and Phalanx is winding down. Clash of Arms published Chariot Lords long ago. But Ed Wimble seems more interested in a game where you could be a Viking Sea King than in Normannia (the Viking Age in the West). And while I have a game that might serve the purpose, it isn't anything like Britannia. 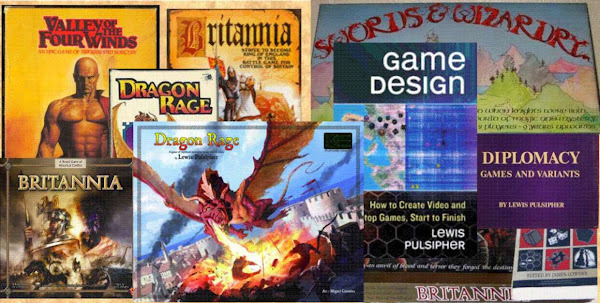 An obvious choice for wargames is GMT, but I've discovered that their taste in games (which may also be their customers' tastes, of course) doesn't run to Britannia-like games. At PrezCon this February, four people (GMT fans, including the game acquisition person at GMT) played Barbaria. I already knew that I was "up against it" because of his dislike of Britannia. He said the reason was that he didn't like playing a quite long game where, if he screwed up early on, he had no chance of winning. Well, we all know that isn't really true of Brit (though you can screw up bad enough early on to make it really difficult). But I thought Barbaria, which has been played in an hour and 40 minutes, would erase that objection. And while that's true, I missed the other aspect of CDW that is vital to his (and the other players') satisfaction. They want to feel like they're really there, that they're participating in the event. The CDW allow this because each card represents an historical event. On the other hand, I don't feel that need to participate in the least when I play games, I'm playing a game, not leading an army or a nation; the game might represent history, but I'm not IN history. If I want to feel like I'm participating in something not of my current world, I play D&D. And I'd much rather be a hero of fantasy than a general in the Civil War (or whatever). If I want to learn history, I read a book; books are much better vehicles for history than games. Well, Brit-like games have none of this participatory feeling, which is inevitable at the scale of hundreds of years per game. In many sweep of history games, few if any nations survive throughout the game, let alone individuals. Barbaria has two versions, one longer and more complex than the other (and there's a third, five player version, using a different board, that I've spun off as a separate game, as it is MUCH more complex). There are 17 nations, only 6 turns, average 40 pieces, to represent 850 years of European (and N African/Near Eastern) history. Hence the game is quite short, simple to play, but not richly detailed (in boardgames you can have only two out of three). So the upshot was, these folks--none of whom had played Brit more than a few times--found Barbaria to be too simple, too directed, lacking in anything that grabbed them, though one pointed out quite correctly that it would be good for educational purposes. They wanted to know why the Huns, e.g., scored for raiding in Bavaria, and I can compensate for that by using a much larger nation card that includes the history of the people. They wanted more differentiation of units (there are infantry, cavalry, and leaders), which is absolutely pointless historically at this scale. They wanted more freedom of action, and at that scale I cannot give it and still have the game reflect actual history. In other words, they wanted to feel like they were there, I think. So in that mantra of "short, simple to play, and richly detailed," what might satisfy these folks is a long game that has the detail. I have a much bigger and longer five player version of Barbaria that might serve, though I am still doubtful about providing enough differentiation and color and variability to satisfy. Yet most of the games I've been designing for the past several years have at their heart the saying "A designer knows he has achieved perfection not when there is nothing left to add, but when there is nothing left to take away." I have another game system that might serve the purpose, though it, too, can lack some color at this scale. I am more likely to try new game systems for GMT than to try anything directly related to Britannia. But for wargames I am still primarily interested in the Sweep of History, and that poses a big "you are there" problem. One hypothesis that came to mind out of this, is that Brit players may also play RPGs, where the CDW players may not. The game acquisition honcho doesn't play RPGs, too "loosey-goosey", he prefers to know exactly what he can do. I ran a little pole at a Brit site and (with too few responses) RPGs seem to be favored by half, not played at all by half. Which blasts my hypothesis. A different form would be, "CDW players don't play RPGs". Though that, too, has its flaws. Sometime I need to try a poll with braoder reach. Who does this leave to me? In general, for broader-market publishers anything like Britannia is too complex (a Britannia card game might do for educational purposes, I should go back to that). And for narrow-market publishers, each has its own style (e.g., CDW for GMT). And there just aren't many publishers of wargames, period. FFG, in case you weren't aware, has already said they have no interest in other Brit-like games or in Brit expansions. FFG games these days positively DRIP with atmosphere, lots of colorful, detailed cards, lots of plastic pieces, fairly complex rules, and that works fine for them. I don't know what will happen when Brit goes out of print again. Reprints are rare, this edition has had one already, so I'm not expecting yet another reprint. Perhaps FFG will want to do "Brit 3", a more radical revision of the game, but I am not counting on it. On the other hand, if they decide not to continue, then the rights will revert to me. But the "out of print" time for Brit is quite a ways in the future, most likely, we're talking about several years before the ultimate determination. Much of our playtesting lately has been with two quite different space wargames. People like to play, I like where I've gone with them and enjoy watching them (as you know, I rarely play games other than solo tests), but I have great doubts about being able to find a publisher because of the kinds of games they are. The first, "Doomstar", is a radical development of L'Attaque, which is the close ancestor of Stratego. L'Attaque was patented in France (by a woman) in 1909; Stratego is a slightly-modified post WW II knockoff by a Dutchman. My game "Swords & Wizardry," published around 1980 by the British publishers of L'Attaque, is a considerable development of that game. But Doomstar is very different, far more fluid: fighters (there are many) are weak but two can move in one turn, and move great distances, and they can combine strength to attack the same square. Add to this the slingshot (90 degree turn) effect of "Black Holes" in the center of the board, and all kinds of different games can develop. Add ships with special abilities to vary the game further. The intro game is 18 ships a side and lasts 20 minutes. *I* would say, and others have said, that it's much better than Stratego, with most of the virtues of that game and few of the drawbacks. There are a few mini-mass market firms to approach, and even the Dutch company that licensed Stratego to the US publisher (now Hasbro). Ultimately I may even try Hasbro just so that Mike Gray can tell me to forget it. Limited possibilities. Doomstar is about 30 years old, though with significant improvements made since I dug it out of storage a year or two ago. The other game is "The Star Princes." This started as a turn-based "introductory wargame" after a discussion with the future-publisher of the reissue of Dragon Rage. But it quickly became too complex to be an introductory wargame, though it isn't too complex for video gamers who don't ordinarily play boardgames. On the other hand, it IS too complex for someone who isn't used to playing games about war, too many decisions, whereas Doomstar doesn't present the same problem. There's a strategic geomorphic board (each section is 25 hexes), and a small tactical hex board for battles. (I'll interject that the strategic boards look great, if I do say so myself.) The strategic board has various locations of economic value, plus black holes, "quasars" (impassable), and dust clouds that limit which ships can enter. Play starts with face-down placement of ships (which are one inch squares) two at a time, in turn. This introduces considerable fog of war, but any ship in a dust cloud must be revealed (to show it can legally be there), any ship in a battle will be revealed, and any ship that moves more than one hex must be revealed (to prove it can legally move there). Sometimes the revealed ships can go into a pile in a hex, and only the top piece can be seen by the opposition. Unlike Doomstar, which is a tactical battle game, this is a war game, so economics rule. Whichever player gains the upper hand in valuable areas occupied will, in the long run, have more ships. The two player game actually ends when a player's Prince is killed or his "orbital fort" (which cannot move) is destroyed. And surprisingly often, this is what happens, as the player who has fallen behind economically takes desperate measures with his prince, who boosts morale of adjacent ships when in battle. Occasionally the player who is clearly "behind" can pull off a victory thanks to his Prince. Attacks use the same combat resolution I devised for Valley of the Four Winds more than years ago, two dice, each unit has an attack number and adds the target's defense number. In battles the defender places one ship, then the attacker, and so forth according to simple rules. Then they fire, defender first, one at a time, NOT simultaneous (if a ship is destroyed before it fires, it doesn't get to fire). Most ships have a range of one hex, some two. There's more to it, but I must say the battles work remarkably well. Chance plays a part (there's the legendary Armed Merchantman that defeated a Mothership (fighter carrier) and a Dreadnought in single combat), but if you have the preponderance of force you usually win. Big battles (more than 4 or 5 ships, largest ever was 20) are sometimes spectator events at the NC State game club. You generally start with 11 or 18 pieces, depending on the version. Tactics are fairly straightforward. Strategy is more important than tactics. Someone with good strategy will beat a poor strategist even if luck is with the latter. I designed the game for two players and have some neat asymmetric scenarios, but it's as often played with three or four as with two. It's a long game with four, and I can't say it's particularly suitable for four, but people enjoy it that way. But who sells hex space wargames that require thick pieces that can be manipulated well (face-down and face-up)? No one I can think of. But I sure have enjoyed developing it. You can click on the article title to get to my "in process" page, where you can see the maps. The Doomstar map is a little out of date, I have eliminated one row at top and bottom.